Revolver Boats launches a new and surprising product – the Revolver 44GT, the zippy 14-meter grand tourer of the sea. This elite, high performance vessel with exciting sporty lines, comfort and safety, and an optimal range for long crossings is mix of “power & cruise”, under the banner of sophisticated design. It is the perfect balance of luxury, avant-garde technology, and innovation. Revolver 44GT isn’t a “normal” powerboat; it is an impressive display of raw power and speed, great range, functionality, and comfort. All of this has been made possible by the technical choices made by the Revolver technical team, starting with the two Cummins diesel 550 HP engines paired with Arneson Surface Drives. These ensure great agility and flexibility as well as performance and high cruising speed. 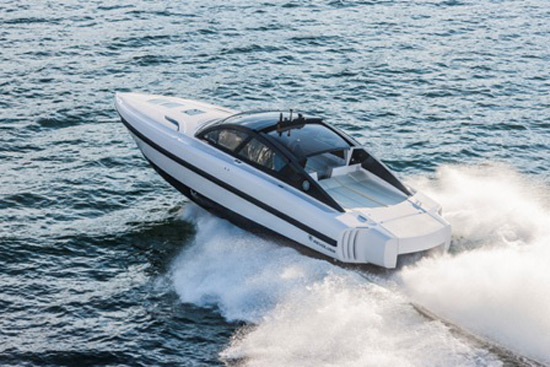 Revolver 44GT can easily exceed a maximum speed of 50 knots in total comfort and safety. The exteriors are by Alberto Mancini (AM Yacht Design), a young but already acclaimed Italian designer. The interiors are by Michael Peters (MPYD – Michael Peters Yacht Design) and represent an evolution over the 42R, introducing new stylistic elements to ensure the Revolver 44GT is even more innovative and cutting edge. Mancini wanted to emphasize that unmistakable dynamic quality, referencing car design in the exterior lines as well as interior detailing. reminiscent of high-end cars from the 1960s and the bow with original LED lights built into the protective and powerful fender rail that defines the profile. The interior layout focuses on the large central structure that houses the control panel and helm station. The separate captain and co-captain seats are custom designed with a carbon look and are both comfortable and functional. 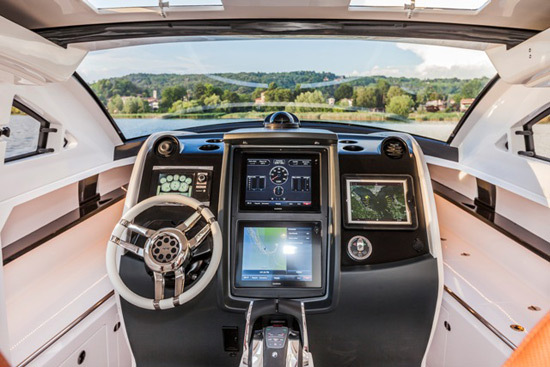 The ergonomic central console between them houses the control panel, including large, latest-generation Garmin touch screens for navigation. The helm station has an integrated dual monitoring system, for greater security, that also interfaces with the navigation screens. And of course, there is an iPad dock station that controls the multi-zone HIFI system for the different areas of the vessel. Behind the helm station there are four passenger chairs that pick up on the aesthetics of the captain and co-captain chairs. Another key feature of the 44GT is a spectacular glass roof (electronically operable) as well as a rear glass door that opens up (hiding away in the engine room).The whole operation happens wirelessly and only takes a few seconds.Opening and closing the glass roof by remote control is practical, fast, and dramatic. Below deck, in the bow, there is a large perimeter sofa that can be converted into a double bed by folding down the table, as well as a kitchen and minibar. A surprising feature is the spacious bathroom with “rain shower” with unusually high ceilings for this class of boat. 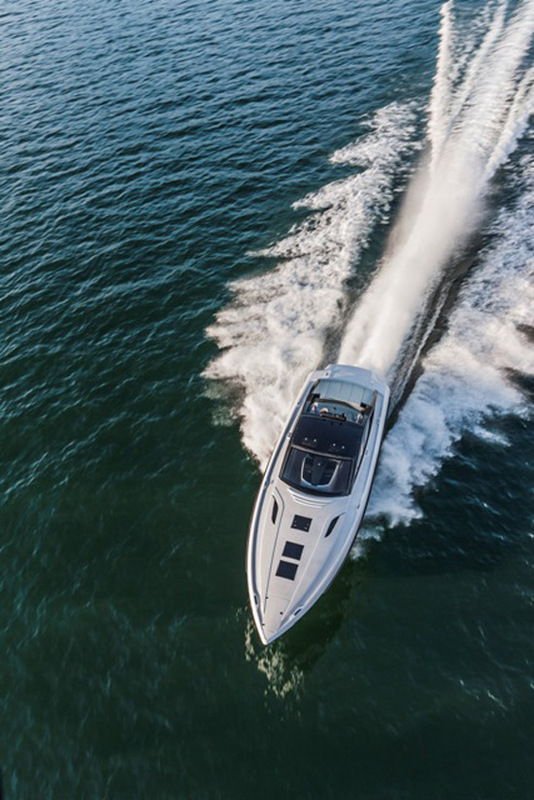 Because of its performance and design excellence, the flagship Revolver 44GT caters to demanding boatowners who appreciate aesthetic and technological beauty.